Lorcan McWilliams was the hero as Derry came from 10 points behind in Clones to book their place in the final against Armagh. Down's Conor McCrickard, with his accurate free-taking, and Lorcan McWilliams was equally clinical at the other end and nudged the Oak Leaf into a two-point lead. But the Mourne men struck two goals in four minutes through Pierce Laverty and Aaron Devlin, and two points from the excellent Daniel Guinness, to send Down in with a 2-8 to 0-7 interval lead. 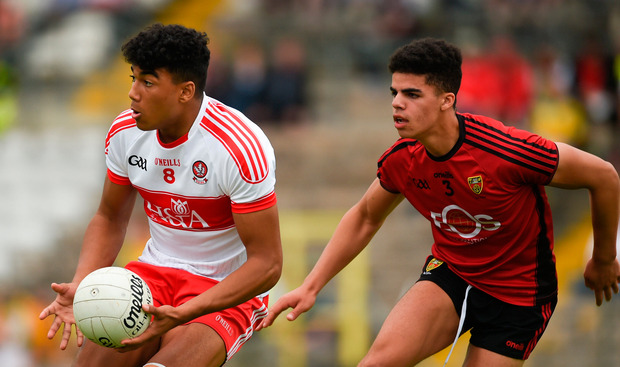 They went 10 clear but Derry responded with goals from Lorcan McWilliams (penalty) and Callum Brown, and went in front with a Ben McCarron free. Down kept in touch through Guinness and Jack McCartan, but lost skipper Oisin McConvey to second yellow/black cards. Derry got themselves over the line with scores from McWilliams, who finished with 1-7, and Conleth McShane. Scorers - Derry: L McWilliams 1-7 (1-0 pen, 5fs); B McCarron 0-4 (1f); C Brown 1-0; O McWilliams 0-3; C Doherty (1f), C McCluskey, C McShane 0-1 each. Down: A Devlin 1-2 (1f); P Laverty 1-1; C McCrickard 0-4 (4f); D Guinness 0-3; L Kerr 0-2 (1f); A Magee, J McCartan, C Cox 0-1 each. Ref - C Dourneen (Cavan).